India.Arie has been one of my favorite artists since I was a tween who listened to her empowering song "Video" on repeat. In fact, I still listen to it when I need a confidence boost and a reminder that everyone is beautiful in their own way. 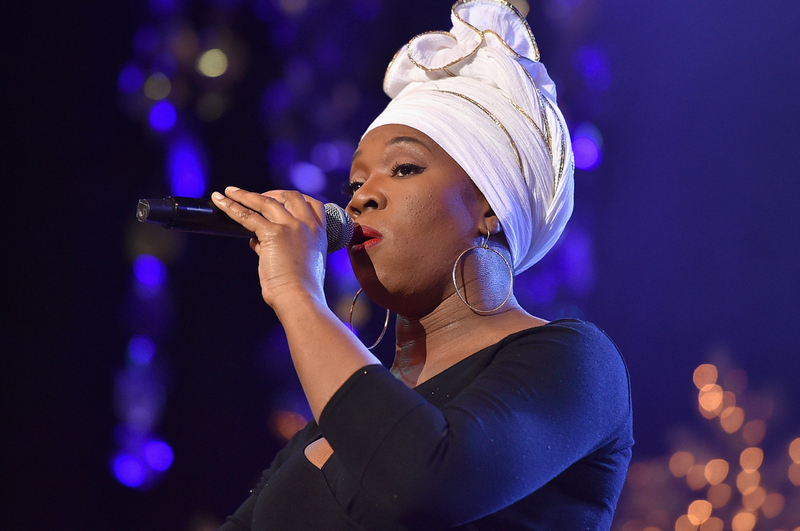 She's a four-time Grammy winner with versatile singing skills, and I can't wait to listen to her latest album, Christmas With Friends — especially after watching India.Arie sing at the Hollywood Christmas Parade. She performed "Let It Snow," and my only complaint is that the performance wasn't longer. Arie's voice sounds stronger, clearer, and more beautiful than ever — and her stage presence is amazing. I thought "Let It Snow" was hands-down the highlight of the Hollywood Christmas Parade — and my digital download of Christmas With Friends can't finish quickly enough. Arie's Christmas album features classics such as "Silent Night," "God Rest Ye Merry Gentleman," "Auld Lang Syne," and "Merry Christmas Baby." Although some of the songs feature Arie singing solo, she chose to collaborate with a variety of artists. "Silent Night" features Brandy, and "Merry Christmas Baby" is a duet with Michael McDonald. Tori Kelly, Gene Moore, Jr., and Kirk Whalum are also featured. Based on her performance at the Hollywood Christmas Parade, I think we can rest assured that Christmas With Friends will undoubtedly bring plenty of comfort and joy to its listeners this holiday season. Now, if you'll excuse me, I'm off to listen to my latest album acquisition.